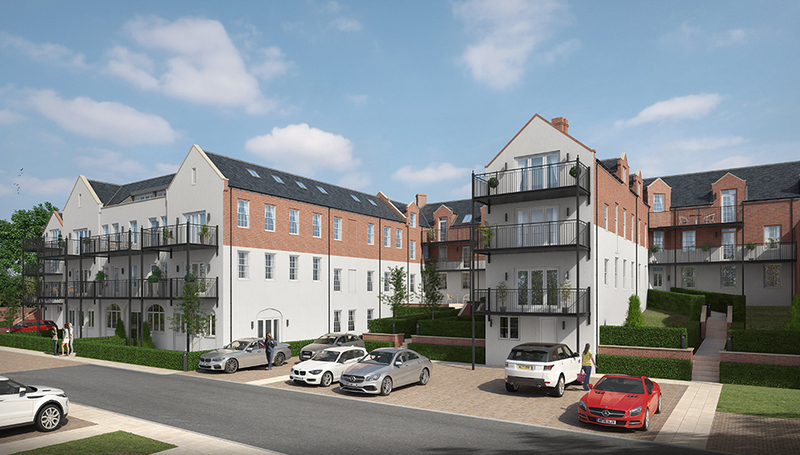 This is your last chance to own unique piece of heritage, a two bedroom/two-bathroom apartment at our characterful St Gregory’s development in the historic town of Sudbury in Suffolk. Our conversion of the former Walnuttree Hospital buildings has been incredibly popular both with people who already love this thriving market town and new commuters who appreciate both the quality of life on offer and the value for money. – Click here to see what one of our residents had to say. Plot 32 is in the main historic building and offers spacious living together with a master bedroom suite with shower, guest bedroom and separate bathroom. It’s a light, bright apartment on the first floor, but best of all is the wide balcony that runs the length of the kitchen/living space and gives wonderful views over the neighbouring Water Meadows. Priced at £309,950 , the property also includes two dedicated parking spaces. Sudbury is just a 90-minute train journey from central London but offers a different pace of life with a busy weekly market, independent shops and restaurants and the wild open acres of the historic Water Meadows which have been public land for centuries. If you are interested to know more, please contact the St Gregory’s marketing team on 01787 813 117 or call in to the development which is open Thursday to Monday 10am to 5pm. If you wish to find out more about St. Gregory’s Place click here.